David B. Meleca, FAIA, looks to the past when designing new churches and other buildings. It was the great cathedrals of England that opened David B. Meleca’s eyes to the beauty of traditional ecclesiastical architecture in contemporary settings. His long-ago study-abroad summer in Oxford took place while he was in architecture school at The Ohio State University in his hometown of Columbus. David B. Meleca, FAIA, founded David B. Meleca Architects, LLC, of Columbus, OH, in 1996. 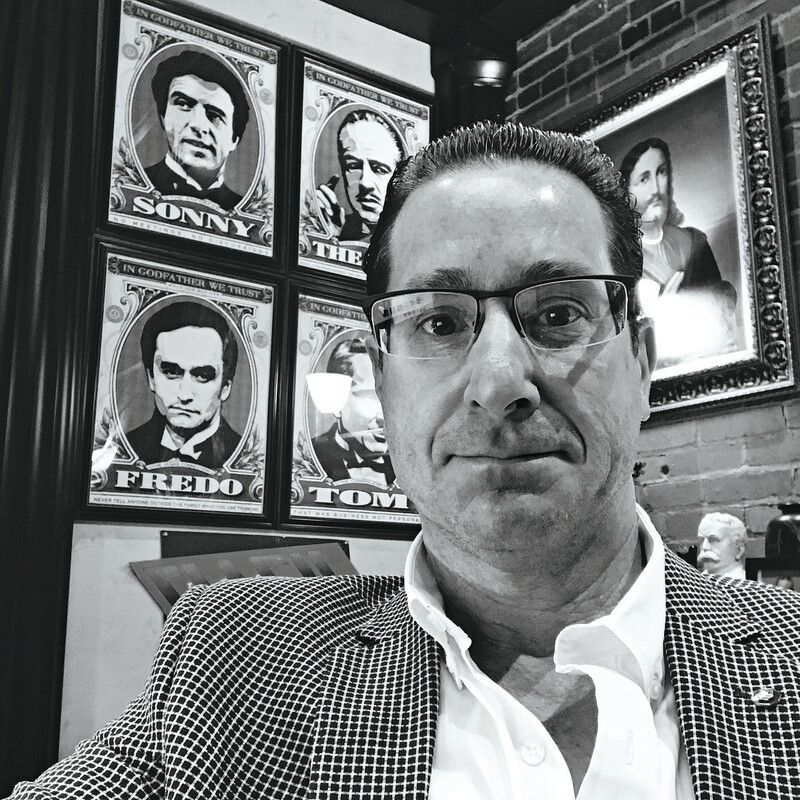 After working 11 years for Sullivan Gray Bruck Architects in Columbus, Meleca opened his own firm in 1996, building a name for himself as an award-winning traditionalist and a national leader in Roman Catholic church design. Meleca, who works with a team of 10 architects, practices what he calls “creativity through tradition.” David B. Meleca Architects has been named by the Classical Institute as one of the top 100 Classical design firms in the world and has a diverse portfolio that includes restaurants, offices, apartments, hotels and retail as well as churches. His most visible public project—The Cap at Union Station in Columbus, a mixed-use plaza that bridges the urban gap of Interstate 670 where a trio of spans converge to form new retail frontage—has been the center of national attention and acclaim. Since its completion in 1996, it has received five awards, including the 2002 Ohio Chapter of the American Society of Landscape Architects ASLA Merit Award, the 2005 Columbus Landmarks Foundation James B. Recchie Design Award and the 2006 Congress for the New Urbanism CNU Chapter Award. Although most of Meleca’s work is commercial—he designed the flagship Victoria’s Secret store in Easton Town Center, an indoor and outdoor shopping complex in Easton, OH—he cherishes his ecclesiastical work. “I strive to invoke the revelation of Heavenly Jerusalem, substantiate the priest’s role in the revelatory ritual and deploy a classical vocabulary as the embodiment of the exceptional—truth, beauty and clarity—that is most accessible to a broad public,” he says. 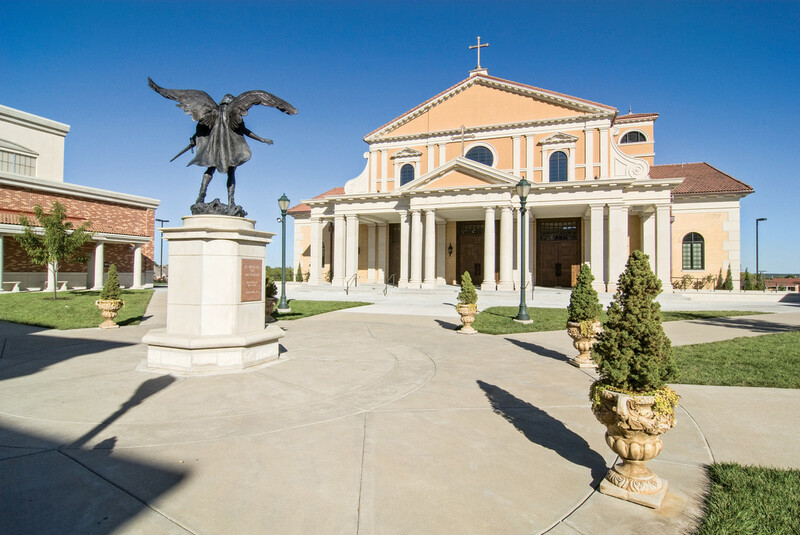 Multiple classical orders were incorporated for their structural and anthropomorphic meanings to make a classically readable whole at Saint Michael the Archangel Catholic Church in Leawood, KS. 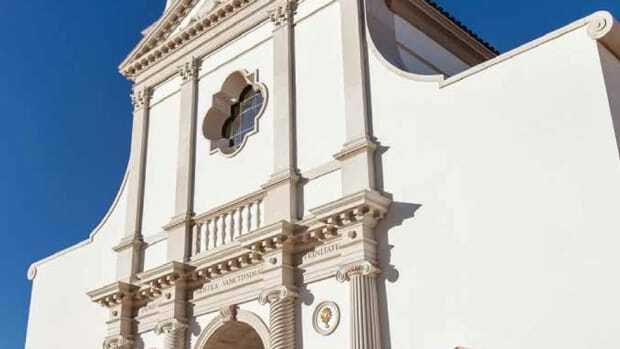 Meleca wanted to bring church buildings back to their religious design roots, so he contacted the diocese and waited what seemed an eternity to get on a list of recommended architects. Meleca frequently collaborates with or consults with Denis R. McNamara, associate director and associate professor at the Liturgical Institute of Mundelein Seminary in the Archdiocese of Chicago and the author of Heavenly City: The Architectural Tradition of Catholic Chicago and Catholic Church Architecture and the Spirit of the Liturgy. 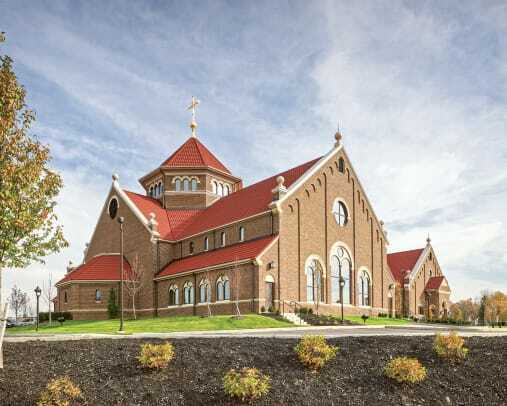 When Meleca was commissioned to design a larger house of worship for the parishioners of Saint Edward The Confessor Catholic Church in Granville, OH, his mission was to strike a balance between classical Roman Catholic church design and unpretentious country church aesthetics while creating a sacred space for the congregation, which had increased to 900 people. 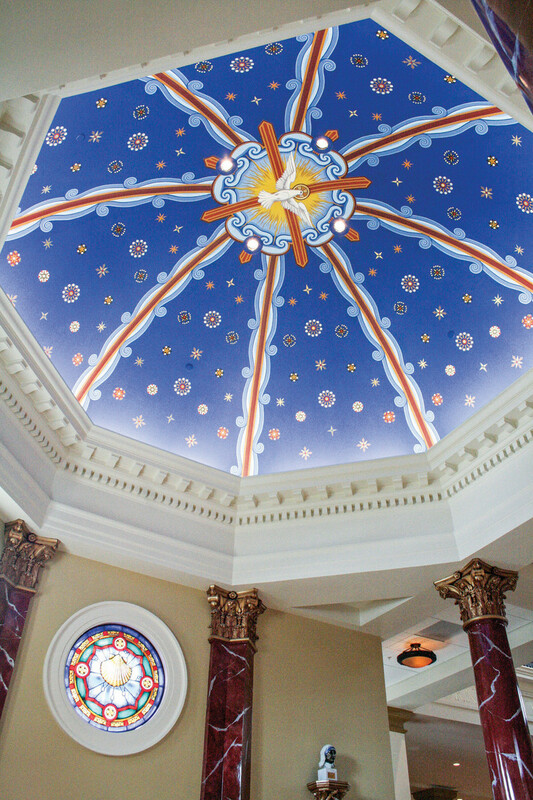 At Saint Michael the Archangel Catholic Church in Leawood, KS, the baptistry mural, by EverGreene Studios, features brightly painted decorative ribbings, heavenly stars and the holy spirit. “The original church was essentially a 300-seat country chapel,” he says. “There was a lot of emotion attached to it, and there wasn’t much budget, so we reused it, turning it into the narthex of the new complex.” He designed the brown brick building, in the American Georgian style, to grow with the parish: The design incorporates 300-seat balconies that can be added to the 14,500-sq.ft. building when they are needed. 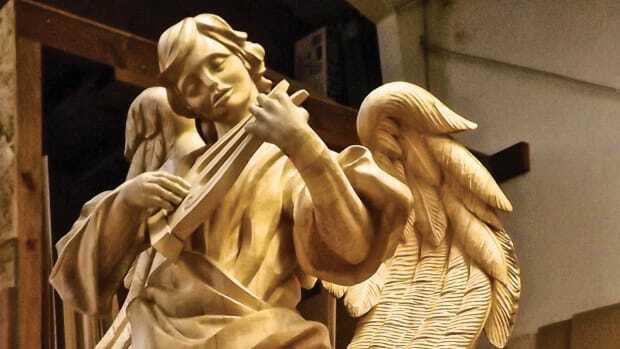 At Saint Michael the Archangel Catholic Church in Leawood, KS, the style—Italian Renaissance—was a given because its twin-winged U-shaped school had already been built. The church was to be set in the center, completing the trinity. “This was my first engagement with Denis McNamara,” Meleca says. “I was holding the pen, and he was critiquing the liturgical aspects.” Meleca’s stucco structure detailed with Kansas limestone adhered to classical orders and featured a Greek-cross floor plan. “It’s a spiritual representation of heaven,” Meleca says. 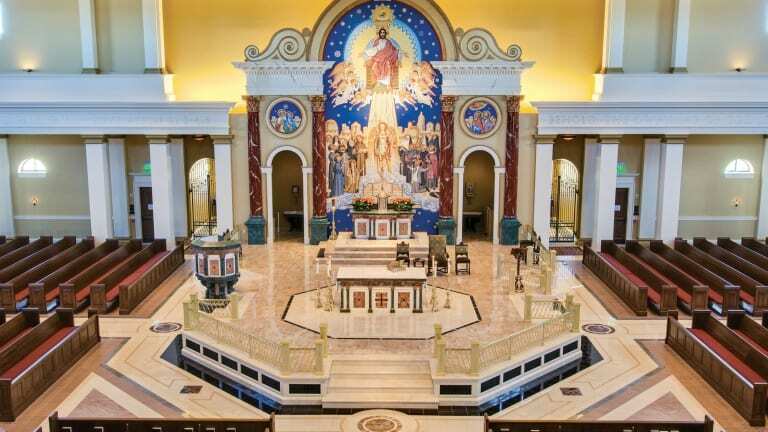 “There’s seating on three sides of the sanctuary, allowing for a close view of the altar and ambo, which further engages parishioners in the signs and symbols of heavenly realities as outlined by the Second Vatican Council.” Meleca also designed the altar and baptismal font, which were made in Italy and assembled on the spot. Meleca’s brown brick and Jerusalem limestone building in the Romanesque style makes quite a statement: It’s an astounding 40,000 square feet and has seats for 1,200 people. A 20-ft.-high gilded cross and bold Romanesque finials on the corners and cupula make it a commanding presence on the sublime skyline. To create a cozy feeling in such a large space, Meleca placed the altar and ambo in the apex of the cross and raised them 3 and 5 feet, respectively, to make them more visible to all. The seats are situated on three sides of the altar, a plan that left enough room to accommodate a private chapel behind. Stained-glass windows, salvaged from closed churches, add ambience as well as a sense of shared history. The project, which was named one of 10 National Treasures by U.S. Catholic Magazine, attracts worshippers from around the country. 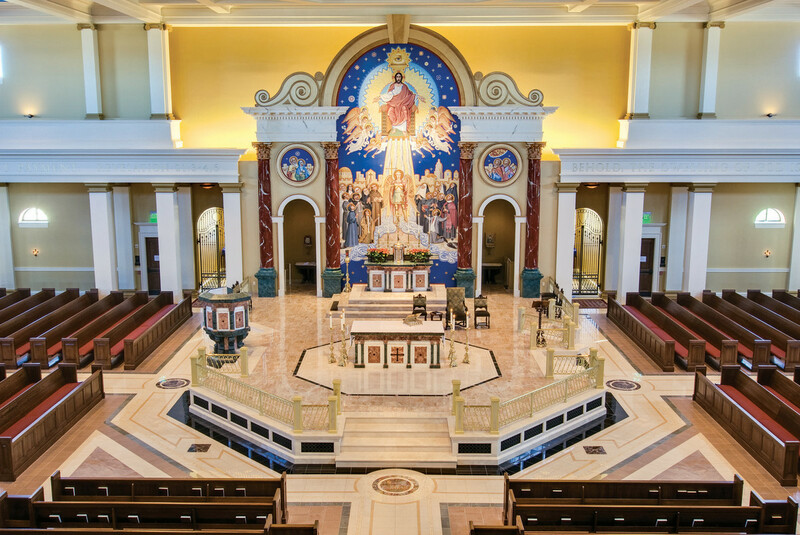 One of Meleca’s more recent projects, Saint Elizabeth Ann Seton Parish in Pickerington, OH, gave him a chance to bring tradition back to the interior of the contemporary structure. 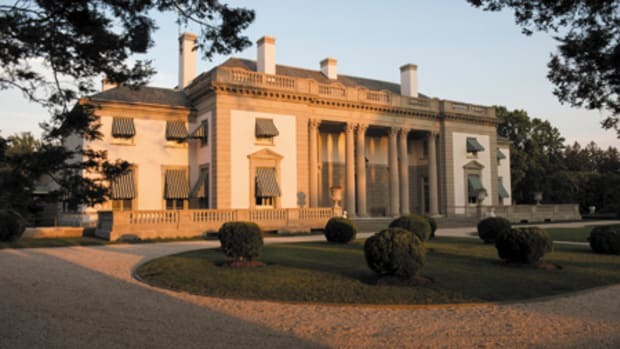 The 30,000-sq.ft. stucco and limestone octagonal church building, which was 20 years old, was desperately crying out for a traditional religious renovation. The sanctuary roof was leaking, the floors were cracking and the pews were delaminating. Infrastructure aside, there also were design issues that were glaringly out of sync with liturgical thinking. The stadium-style seating sloped downward toward the front, the altar platforms were separated, the processional aisle was at an acute angle to the altar and the 24-hour Eucharistic adoration chapel was too small to accommodate the number of parishioners who were using it and was virtually hidden in a side room off the sanctuary. His spiritual solutions were simple. He created a major axis and sited the altar, tabernacle and baptismal font along it to emphasize their importance and centered the seating around the liturgical altar, which is crowned by a hanging crucifix. The altar and ambo were elevated above the nave floor onto a large platform decorated with red stonework to represent the blood of Christ. These so-called blood stones flow down to the sanctuary floor and continue to the back of the church, where they symbolically pool into the baptismal font for the parish’s purification. The narthex and portico were also located on the axis and expanded to create a more prominent entrance to the church. The adoration chapel was placed behind the altar. It features a private entry, separate restroom and shares a two-sided tabernacle with the sanctuary, which is surrounded by a stained-glass window with fan-shaped rays of light and radiant angels. Duncan G. Stroik, “a one-man phenomenon who has changed the landscape of American Catholic church design,” is the recipient of the 2017 Clem Labine Award.